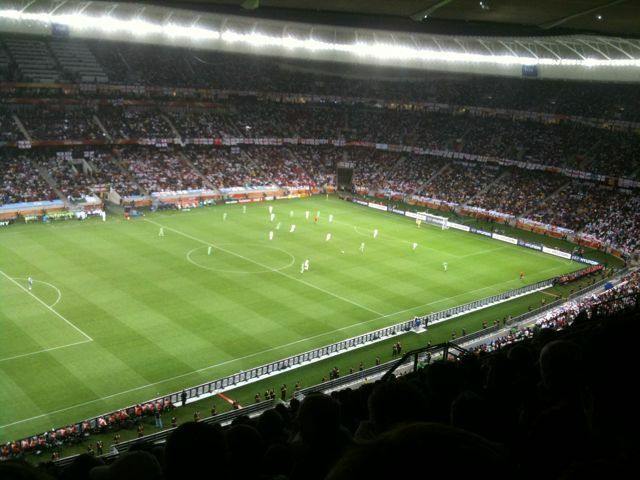 Great stadium and great turnout for the England vs Algeria game. As the tournament progresses, the vuvuzelas get (thankfully) quieter. It was a 0-0 in which the Algerians made the English look really bad at times. Photos from the real camera will have to wait. Here’s a crappy phone pic. yes, the english team played horribly badly, but its unbelievable how aggressively negative the “fans” are here in england. i cannot understand the level of obscenities the englishmen in the pub yelled at the players on the TV during the match. were you there when they boo-ed the team off the field? unbelievable!